The other day I was listening to National Public Radio's Car Talk, a popular weekly broadcast during which callers ask questions about their vehicles. Before every program break, the show's hosts ask callers to dial 1-800-CAR-TALK, which corresponds to 1-800-227-8255. Of course, the former proves much easier to remember than the latter, in part because the words "CAR TALK" are a composite: two words that represent seven digits. Humans generally find it easier to deal with composites, rather than their individual components. Likewise, when you develop object-oriented software, it's often convenient to manipulate composites just like you manipulate individual components. That premise represents the fundamental principle of the Composite design pattern, the topic of this Java Design Patterns installment. Before we dive into the Composite pattern, I must first define composite objects: objects that contain other objects; for example, a drawing may be composed of graphic primitives, such as lines, circles, rectangles, text, and so on. Java developers need the Composite pattern because we often must manipulate composites exactly the same way we manipulate primitive objects. For example, graphic primitives such as lines or text must be drawn, moved, and resized. But we also want to perform the same operation on composites, such as drawings, that are composed of those primitives. Ideally, we'd like to perform operations on both primitive objects and composites in exactly the same manner, without distinguishing between the two. If we must distinguish between primitive objects and composites to perform the same operations on those two types of objects, our code would become more complex and more difficult to implement, maintain, and extend. Implementing the Composite pattern is easy. Composite classes extend a base class that represents primitive objects. Figure 1 shows a class diagram that illustrates the Composite pattern's structure. 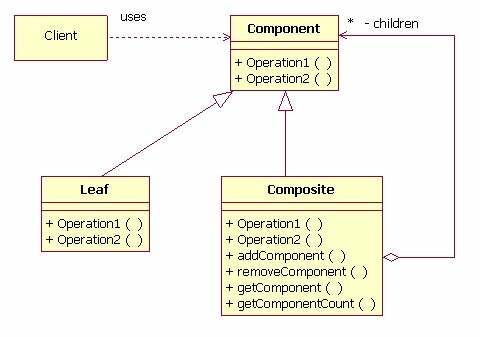 In Figure 1's class diagram, I used class names from Design Pattern's Composite pattern discussion: Component represents a base class (or possibly an interface) for primitive objects, and Composite represents a composite class. For example, the Component class might represent a base class for graphic primitives, whereas the Composite class might represent a Drawing class. Figure 1's Leaf class represents a concrete primitive object; for example, a Line class or a Text class. The Operation1() and Operation2() methods represent domain-specific methods implemented by both the Component and Composite classes. For every method implemented in the Component class, the Composite class implements a method with the same signature that iterates over the composite's components, as illustrated by the draw() method listed above. The preceding method is passed a component—either a simple component or a composit—then it invokes that component's draw() method. Because the Composite class extends Component, the repaint() method need not distinguish between components and composites—it simply invokes the draw() method for the component (or composite). Notice that the addComponent() method is passed a Component reference, which can be either a primitive component or a composite. Because that component can be a composite, you can compose components into a tree structure, as indicated by the aforementioned quote from Design Patterns. Figure 2 shows an alternative Composite pattern implementation. But, if the Component reference in the preceding code fragment does not refer to a Composite, what should the addComponent() do? That's a major point of contention with Figure 2's Composite pattern implementation. Because primitive components do not contain other components, adding a component to another component makes no sense, so the Component.addComponent() method can either fail silently or throw an exception. Typically, adding a component to another primitive component is considered an error, so throwing an exception is perhaps the best course of action. So which Composite pattern implementation—the one in Figure 1 or the one in Figure 2—works best? That's always a topic of great debate among Composite pattern implementers; Design Patterns prefers the Figure 2 implementation because you never need to distinguish between components and containers, and you never need to perform a cast. Personally, I prefer Figure 1's implementation, because I have a strong aversion to implementing methods in a class that don't make sense for that object type. Now that you understand the Composite pattern and how you can implement it, let's examine a Composite pattern example with the Apache Struts JavaServer Pages (JSP) framework. The Apache Struts framework includes a JSP tag library, known as Tiles, that lets you compose a Webpage from multiple JSPs. Tiles is actually an implementation of the J2EE (Java 2 Platform, Enterprise Edition) CompositeView pattern, itself based on the Design Patterns Composite pattern. Before we discuss the Composite pattern's relevance to the Tiles tag library, let's first review the rationale for Tiles, and how you use it. If you're already familiar with Struts Tiles, you can skim the following sections and commence reading at "Use the Composite Pattern with Struts Tiles." Note: You can read more about the J2EE CompositeView pattern in my "Web Application Components Made Easy with Composite View" (JavaWorld, December 2001) article. Designers often construct Webpages with a set of discrete regions; for example, Figure 3's Webpage comprises a sidebar, header, content region, and footer. Figure 3. The Composite pattern and Struts Tiles. Click on thumbnail to view full-size image. Websites often include multiple Webpages with identical layouts, such as Figure 3's sidebar/header/content/footer layout. Struts Tiles lets you reuse both content and layout among multiple Webpages. Before we discuss that reuse, let's see how Figure 3's layout is traditionally implemented with HTML alone. The preceding JSP has two major drawbacks: First, the page's content is embedded in the JSP, so you cannot reuse any of it, even though the sidebar, header, and footer are likely to be the same across many Webpages. Second, the page's layout is also embedded in that JSP, so you likewise cannot reuse it even though many other Webpages in the same Website use the same layout. We can use the <jsp:include> action to remedy the first drawback, as I discuss next.